An audio with how-to and philosophical ambitions succeeds on both accounts as the author takes productivity principles and practice to a whole new level. Allen is very psychologically minded--keenly aware of the attitude shifts people experience when certain strategies are put into play. He's very prescriptive, urging us to get little things done, work through blocks, and jettison defunct strategies that protect us from new directions. He's eloquent when exhorting us to tap into deeper levels of meaning before starting on any path and especially before involving others in our purpose. These are cutting-edge ideas on productivity, especially when dealing with the gnarly issue of setting up structures in our lives that really work--structures that eliminate behavioral clutter and keep us on track. T.W. © AudioFile 2004, Portland, Maine-- Copyright © AudioFile, Portland, Maine --This text refers to the Audio CD edition. David Allen is president of the David Allen Company and has more than two decades' experience as a management consultant and executive coach, having worked with organizations such as Merck, the Ford Foundation, and the U.S. Navy. He has been featured in Fortune, Fast Company, The Wall Street Journal, the Los Angeles Times, and many other publications. In Getting Things Done, David Allen offered a breakthrough system to enhance productivity-at work and in daily life. Now "the guru of personal productivity" (Fast Company) asks readers what is holding them back and shows how they can be ready for anything-with a clear mind, a clear deck, and clear intentions. With wit, motivational insights, and inspiring quotes, Ready for Anything shows readers how to make things happen with less effort, stress, and ineffectiveness, and lots more energy, creativity, and clarity. This is the perfect book for anyone wanting to work and live at their very best. Author David Allen lists 52 basic principles for productivity, including: write everything down, do the jobs that nag you, focus on the matter at hand and so on. As he notes, the principles are both simple to understand and difficult to implement. The book is essentially a collection of gleanings from the author's previous writings, so it does not present a systematic or unified approach to time and productivity management. However, Allen's straightforward tips are handy, if sometimes duplicative. The number 52 suggests that you might find one helpful tip to use each week in a one-year program of self-improvement and productivity management. In that case, repetition is probably a good thing, since bad habits tend to spring up again like weeds and require the same remedies often. The author is relentlessly upbeat, optimistic and witty, like a motivational speaker. That might be hard to read in a big chunk, but it is easy to digest if you spend a little time every week reading a recommendation and implementing it. 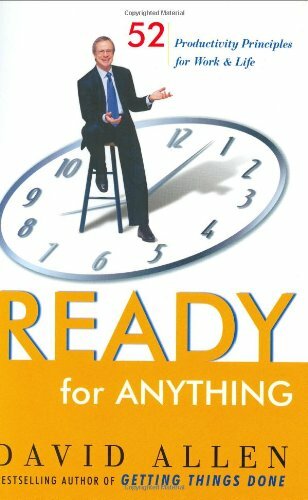 We recommend this book to anyone who urgently needs help with time management and productivity. While this is an outstanding book, I highly recommend his first work, Getting Things Done. Since this doesn't have a consistent narrative but is instead broken up into numerous tiny essays, it will be harder to get the maximum benefit from his approach to personal productivity from this alone. Readers who "got" Getting Things Done don't need my advice on this one...they've already bought it I'm sure. David Allen is probably the smartest personal productivity coach in print. I would buy Getting Things Done for every employee in my organization, and I would have copies of this one lying around to remind people and elaborate on some of the finer points. Oh and I would like to add one point. I believe there is one thing missing from Mr. Allen's algorithm. That is finishing. I think his plan is outstanding for getting unstuck: figure out the next action, and do it without hesitation. But I don't find any attention paid to how to decide how many actions are "enough" for a desired outcome of a project. You can always find some next action, and founder in what software engineers like myself call "permanent beta" or "feature creep." Yet external constraints are best not relied on exclusively for these decisions. It's best to volunteer a ruthless focus on the essence of your project's deliverable, isn't it? So I would like Mr. Allen to write his next book about finishing projects, if he is able to develop insights into that stage as strong as his insights into the process of the middle stages. Mr. Allen's system is surprisingly simple - the realisation that we are monkeys; that keeping to do lists in our heads causes stress; get the list on paper and the stress goes away; we can do simple physical actions with ease. Use a paper filing system; the instruction to ask of each item in our In-tray `what is the next physical action;' the instruction to deal with each item right now if it will take less than two minutes. If Mr. Allen had merely described his system 1) you wouldn't believe it and 2) worse, you wouldn't `just do it.' And JUST DOING IT does work, amazingly enough. `Buy a label maker' - a surprisingly important part of Allen's system. That sounds nuts! Does he have shares in a label making company? Unlikely. Then Why? Remember the monkey approach. Simple physical tasks. Create files. Label them. Don't think. Do it. And then you look at the result. You have created it. You have invested in the system. You are that monkey. And it works! A simple system that works! As the Scots say, Mr. Allen is a very canny fellow. I believe that Mr. Allen wrote his book so deliberately. He makes you invest in reading the book as he makes you invest in his system when you sit there printing labels for manila files. It may be nuts but it is a very clever kind of nuts ;-). This book made me take a new look at the clutter in my mind and life and helped me to create new goals and execute them. If you are stuck, this book will get you going. Read it and get Optimal Thinking-How to Be Your Best Self to learn how to overcome disturbing emotions without a therapist, bring your best self to every situation and achieve the best results. I can assure you with this combination, you will be ready for anything and optimize everything! David Allen has been called one of the world's most influential thinkers on productivity and has been a keynote speaker and facilitator for such organizations as New York Life, the World Bank, the Ford Foundation, L.L. Bean, and the U.S. Navy. He is president of The David Allen Company and has more than twenty years experience as a management consultant and executive coach. His work has been featured in Fast Company, Fortune, The Los Angeles Times, The New York Times, The Wall Street Journal, and many other publications.